In order to detect melanoma early on, you can either check your skin for abnormalities yourself or have a doctor examine it. Skin cancer can be treated more effectively if it is detected before it spreads to other parts of the body. The older you get, the more your skin changes, and new moles or age spots (also known as liver spots or solar lentigines) may develop. This is a normal part of aging. So some people decide to wait and keep an eye on any skin abnormalities. Others want to know right away if something is wrong, and go to a doctor to have it checked out. But it is only rarely a serious disease like cancer. People who have been diagnosed with melanoma say that the affected mole changed in size, shape or color before. Carefully checking your skin on a regular basis is a good way to notice any changes. A full-body check involves inspecting every square inch of your skin, including the skin between your toes, on the soles of your feet, your ears, scalp, back, bottom and in your genital area. When checking parts of your body that are hard for you to see, it can be helpful to use a mirror or ask someone to help. Keeping a record of things like the size of suspicious-looking moles or taking pictures of them can make it easier to tell later on whether they have changed. It can be difficult to know what kind of changes could be dangerous. If you think that something on your skin might be abnormal, and if it doesn't go away within 4 to 8 weeks, it's best to see a doctor. Melanoma sometimes develops inside an older mole, but it is often an entirely new skin growth. It can occur anywhere on your body, even in places hardly ever reached by sunlight: on your scalp, in the genital area or beneath your toenails or fingernails. Commonly affected areas include the chest and back in men, and the lower legs in women. 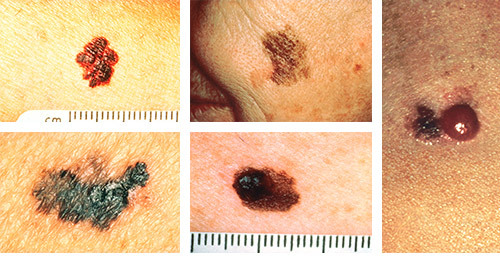 Melanoma typically looks like a flat, dark, irregularly colored spot on the skin. It may be brown or black, bluish, reddish or – in rare cases – even white or partly skin-colored. Sometimes melanomas appear as slightly raised brownish-black bumps. Older people may develop a pre-cancerous condition called lentigo maligna. This appears as brown to dark-brown patches of skin with irregular color. The patches are most often found on skin that is frequently exposed to sunlight. Healthy moles are usually round or oval in shape and tend to be only one color. They normally aren't very big (less than 6 mm in diameter). Asymmetry: The mole has an uneven (asymmetrical) shape. It often has one or more raised areas and is flatter elsewhere. Border: The mole has an irregular border (edge), and may appear ragged, blurred or notched. Color: The mole changes color. It may be several different colors, or an unusual color such as white, blue or red. Diameter: The diameter is greater than 6 mm (wider than an average-sized pencil). Evolving: The mole is changing: It might bleed, leak fluid, itch or crust over. Changes in size, shape, color or the surface are possible, and the mole may become raised. The ABCDE rule helps to recognize melanoma. But not all criteria apply to every melanoma: For instance, if it starts growing on normal skin (not in an existing mole), it often has a smaller diameter than 6 mm. If you have a lot of moles and aren’t sure how to best keep track of them all, it might help to use the “ugly duckling” method. “Ugly ducklings” are moles that stand out from the crowd. This can make it easier to spot abnormal changes in the skin. In Germany, statutory health insurers cover the costs of skin cancer screening every two years in people aged 35 and over. Deutsche Krebsgesellschaft (DKG), Deutsche Dermatologische Gesellschaft (DDG). S3-Leitlinie zur Diagnostik, Therapie und Nachsorge des Melanoms. AWMF-Registernr. : 032 - 024OL. April 30, 2018.